Is Obama Scaling Back Bush's AIDS Initiative? George W. Bush didn't get a whole lot of attaboys on his way out of the White House. But on World AIDS Day near the end of last year, the outgoing U.S. President was the man of the hour, fielding praise from global health advocates and world leaders for the President's Emergency Plan for AIDS Relief, or PEPfAR, which increased tenfold the number of HIV-infected patients in Africa who receive antiretroviral treatments. At megachurch pastor Rick Warren's Global Health Forum on Dec. 1, 2008, Bush lingered to discuss this untarnished highlight of his presidency, a commitment of $15 billion over five years to combat HIV/AIDS. "No U.S. President or political leader has done more for global health," said Warren. But now some critics are wondering if Bush's successor is doing enough. Many global health advocates worry that the success of PEPfAR  an initiative that has consistently enjoyed broad bipartisan support  may be jeopardized by harsh economic realities and shifting political priorities. Although Barack Obama pledged during the 2008 campaign to boost PEPfAR funding by $1 billion each year, his first budget proposed just $366 million more for fiscal year 2010 than the current year, and a majority of the 15 countries that receive PEPfAR funds will see no increase. After five straight years of funding hikes and public-health victories  in 2008, Congress reauthorized PEPfAR with a new commitment of $48 billion over five years, with Senators Obama, Hillary Clinton and Joe Biden all voting in favor of the move  the slowdown has AIDS advocates scratching their heads: Why would the Obama Administration back off from the one universally popular program inherited from Bush? The Obama White House, of course, doesn't see it as a reversal. On Monday a lineup of prominent officials, including Secretary of State Clinton, Health and Human Services Secretary Kathleen Sebelius and presidential adviser Valerie Jarrett, spoke at a White House event to highlight the Administration's efforts on HIV/AIDS. In perhaps an implicit acknowledgement that this year's commitment has been less than robust, the word of the day was recommitment. On Tuesday U.S. global AIDS coordinator Eric Goosby released a five-year strategy for what Obama officials call "the next phase of PEPfAR." As Clinton described it on Monday, that next phase will focus on "transitioning from emergency response to sustainable health systems that help meet the broad medical needs of people with HIV." That's a goal shared by the global health community. But officials at organizations like Doctors Without Borders warn that HIV/AIDS is still an emergency for many countries. South Africa, for example, has the world's largest population of HIV-positive individuals and yet has only recently begun to address the problem. "They were quite slow in scaling up treatments," says Emi MacLean, U.S. director of the Doctors Without Borders Campaign for Access to Essential Medicines. The country's former President, Thabo Mbeki, was a skeptic about AIDS research and refused to make antiretroviral treatment (ART) widely available. "It's really only in the last few years that they've been scaling up AIDS programming, especially nonprevention programming," says MacLean. "As effective as they are, they're late to the game and they need more international resources." The need became even greater on Tuesday, when the country's new President, Jacob Zuma, announced a commitment to test all infants and provide free treatment to those found to be infected with HIV. Health advocates, including both scientists and religious leaders who have petitioned Obama to increase funding, also worry about the stability of the Global Fund to Fight AIDS, Tuberculosis and Malaria. The Global Fund, a foundation that receives funding from both public and private partners, distributes nearly a quarter of all HIV/AIDS donor money. But while PEPfAR saw a small increase in funding for the current fiscal year, the U.S. government's contribution to the Global Fund was flatlined, exacerbating an existing shortfall that threatens its work. A recent paper by Harvard researchers Rochelle Walensky and Daniel Kuritzkes warned that failure to increase HIV/AIDS funding could have serious consequences for countries like South Africa, where only a linear (as opposed to exponential) expansion in the number of people treated with ART would result in 1.2 million avoidable deaths over the next five years. Fears over a slowdown in PEPfAR funding are even more heightened on the ground in recipient countries. According to a November report from Doctors Without Borders, many treatment programs have simply stopped enrolling new patients. "A lot of organizations are told they'll have to keep people on wait lists," says MacLean. "They'll have to ration treatment in a way they haven't had to in the last six or seven years." On Clinton's Africa trip this summer, she met with Nigeria's Minister of Health, who expressed serious concern over the flatlining of funding for PEPfAR and the Global Fund. Nigeria has one of the largest PEPfAR programs in Africa, but its funding has dropped almost $10 million over the past two years, even as the number of patients needing treatment continues to grow. 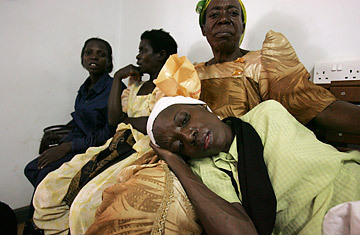 Some health-policy advisers within the Administration, including Zeke Emanuel at the Office of Management and Budget, argue that a more effective global health strategy would shift some funding away from PEPfAR to focus on maternal- and child-health programs, which can produce significant results for a lower cost through food and nutrition programs, as well as treatment for so-called opportunistic diseases like malaria and TB. But many global health advocates argue that this approach unnecessarily pits diseases against each other. A Nov. 25 letter to Obama from a group of progressive religious leaders urged him "to ensure funding for these new priorities does not come at the expense of the commitments and progress already made." But an August letter written by global AIDS coordinator Goosby to U.S. ambassadors in PEPfAR countries indicates that the Administration doesn't believe that balance is possible in the current economic climate. "The landscape around us is changing, with the need to balance a broad portfolio of global challenges at a time of financial crisis," he wrote. "As a result, we need to plan for the next stage of PEPfAR's development in this context and cannot assume the dramatic funding growth of PEPfAR's early years will be repeated." One of the original PEPfAR goals was to attain universal access (defined as 80% of the population) to HIV treatment by 2010. While at least 10 million people worldwide currently receive some care, including more than 2.1 million who are on ART, a majority of HIV-infected individuals still lack access to treatment. "In rich countries, HIV/AIDS is now a chronic illness," Doctors Without Borders' MacLean says. "But in poor countries, it's still a fatal disease." To Maclean and others, one of the most telling numbers in the Administration's new five-year PEPfAR strategy is 4 million  the number of people it is targeting to have on treatment by fiscal year 2014. That's far lower than the 7 million target a coalition of researchers urged the Administration to set, and the goal represents a slowdown from the recent pace of treatment expansion. Since PEPfAR was first implemented in 2004, its affiliated programs have expanded treatment to approximately 400,000 individuals each year. The new target would lower that number to 320,000. After the stunning successes in prevention and treatment over the past decade, that's a bitter pill for global health advocates to swallow.